In March 2008, Bear Stearns, one of the largest investment banks and securities trading firms in the world, rapidly fell apart. The firm could no longer raise private capital to fund its day-to-day activities and, with billions of dollars in liabilities, faced bankruptcy. Fearing a collapse of the investment bank would set off a chain of financial institution bankruptcies, the Federal Reserve partnered with JP Morgan Chase to provide a $29.5 billion bailout for Bear Stearns. While there were many signals in the market before this event, the downfall of Bear Stearns marked the beginning of the oncoming financial crisis that would shake the financial system worldwide and result in a global recession. Over the past decade, we’ve seen a credit boom, leading to rapid expansion in global investment, encouraging the rise of a housing bubble, which ultimately evolved into an international financial crisis. What caused this global financial meltdown? Why did the American economy fall apart? Who is to blame? How are all of these events related? Where do we go from here? In the FAQ we offer simplified answers to these and other frequently asked questions. For a more in-depth analysis see our Economics, Bailouts, and Stimulus coverage. 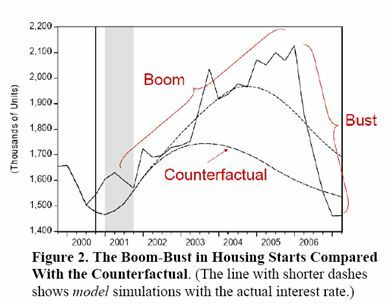 What were the causes of the housing bubble? What are mortgage-backed securities and collateralized mortgage obligations? Why were lenders so careless in issuing subprime mortgages? Why did homeowners take out mortgages that they could not afford to pay off? How did the Federal Reserve respond to the subprime crisis? Was the financial crisis caused by Wall Street greed? How did the housing bubble and subprime crisis turn into the financial crisis? Why did Bear Stearns collapse? Why did Fannie Mae and Freddie Mac fail? Why did Lehman Brothers fail? How did credit default swaps destabilize A.I.G.? What was the role of Wall Street in the crisis? What was the role of the Federal Reserve in the crisis? What role did deregulation play in the crisis? What is the shadow banking system and what was its role in the crisis? How does the Wall Street financial crisis affect Main Street? What do “systemic risk” and “too big to fail” mean? Why was Lehman Brothers allowed to fail while Bear Stearns, AIG, Fannie Mae, and Freddie Mac were saved? If the bailouts stopped the economy from collapsing, why are some people so critical of them? Why did General Motors and Chrysler go bankrupt? How much money have we spent on bailouts and stimulus packages? How will the bailout and stimulus spending affect our national debt? Do stimulus packages really create and save jobs? Who has the United States government bailed out? 1. What were the causes of the housing bubble? An “asset price bubble” occurs when particular products or assets are bought and sold at inflated values. In the case of an asset bubble like the “housing bubble,” property values were inflated. A rapid rise in demand pushed up prices, and a bubble formed as property values increased faster than income levels and the prices of other goods and services. But the ultimate cause of the housing bubble stems from what drove the increase in demand. The government has made easy lending to low-income homebuyers a policy priority for decades. The Clinton administration, both Bush administrations, Congress, and HUD all pushed government-sponsored mortgage companies Fannie Mae and Freddie Mac to encourage more and more subprime loans to low-income homebuyers (see Q9). In the late 1990s, Fannie and Freddie began to rapidly increase the purchasing of mortgages and securitized mortgages (also known a mortgage-backed securities) from the private sector. The banks recognized that the increased demand was because of the government directives and it meant they could issue more mortgages with lowered lending standards, collect the fees associated with origination, and then sell the loans to the GSEs without holding on to the risk. Without the directives from the government that Fannie and Freddie buy more subprime mortgages, the banks would not have been as cavalier in issuing them. This trend of increased lending was all facilitated by a decrease in interest rates set by the Federal Reserve in the wake of the 2001 economic downturn. The decreased lending standards and various government programs promoting homeownership for low-income families combined to push demand forward. And that demand inflated property values, creating the housing bubble. It is worth noting that there are related government policies that distort the real demand for housing, such as tax deductions for residential mortgage interest, which also fed into the housing bubble by making homeownership accessible to a wider range of individuals and families. 2. What are mortgage-backed securities and collateralized mortgage obligations? Pass-through securities are similar to bonds: whoever owns the pass-through gets a pre-established, fixed payment over time. These are low-risk investments, but also provide a limited return to investors. Collateralized mortgage obligations (CMOs) allow investors to get a higher return. CMOs are separated into tranches (which are like uneven slices of a pie). When homeowners make payments on their mortgages the money is directed to the investors of each tranche. The highest tranche, e.g. Tranche A, receives the first stream of payments from the homeowner. Tranche B receives the next share of payments, Tranche C next, and so on. The lower tranches have last claim on payments and, consequently, carry more risk. In exchange for this higher risk, the lower tranches get a larger share of the payments. 3. Why were lenders so careless in issuing subprime mortgages? There are three main reasons that banks relaxed lending standards when issuing subprime mortgages. The first was increased demand from Fannie Mae and Freddie Mac, who were under orders from the federal government to help increase homeownership for low-income families. Banks realized that Fannie and Freddie would buy almost any subprime mortgage and increased their lending to feed this demand. Fannie and Freddie took on the ownership risk of the subprime mortgages so that more of them could be issued to expand homeownership. The second reason stemmed from this increase in demand. As some banks began making money hand over fist by issuing subprime mortgages, every other institution felt the need to compete for this business too. A feeding frenzy emerged where risk concerns were subordinated to keeping up with the success of competitors. And finally, lenders were careless because of commission-based compensation structures that encouraged increased mortgage origination. The financial incentive for a bank employee was tied to quantity rather than quality, since the riskiness of the subprime mortgages was not the biggest concern. The mortgages could either be sold to Fannie and Freddie or securitized to spread the risk around. With housing prices continuing to rise, lenders could make risky loans with the assumption that borrowers would be able to refinance their mortgages at a later time, when interest rates reset to a higher level. Once they refinanced, homeowners would have additional cash from the appreciated value payments on their homes that they could use to make payments on the new mortgage (see Q4). 4. Why did homeowners take out mortgages that they could not afford to pay off? More than half of securitized subprime mortgages were issued to individuals who wanted to refinance their current homes. According to data from the Federal Reserve Bank of Cleveland, these mortgages have performed much better than mortgages for homebuyers. So not all subprime mortgages were issued to those who couldn’t afford them. However, it is true that many subprime borrowers willfully took on mortgages that they would probably not be able to pay off because they knew that if they were ever unable to make their mortgage payments, they would be able to sell their house for a profit in the growing housing market. The majority of subprime mortgages were issued between 2003 and 2007, at the height of the housing bubble, when prices were soaring. When the rate on a subprime mortgage increased after the initial years of the mortgage, subprime homeowners simply sold their homes and got a new low rate mortgage, pocketing the amount the home’s value had increased since the time they had purchased it. This plan, however, depended on the continued increase of housing prices. Everything fell apart when the bubble burst, leading to a surge in delinquent payments and foreclosures. 5. How did the Federal Reserve respond to the subprime crisis? On September 18, 2007 the Federal Reserve announced that it would reduce interest rates in response to the “tightening of credit conditions.” The Federal Reserve (Fed) continued to lower interest rates, all the way to zero, which may have had some unintended consequences (see Q13). In December 2007, the Fed opened the Term Auctions Facility, the first of many credit facilities that allowed banks greater access to emergency funding. On March 11, 2008 the Federal Reserve introduced another credit facility, the Term Securities Lending Facility, to purchase mortgage-backed securities from banks (see Q3). Ultimately, these responses would not be enough to stop the collapse of Bear Stearns in March of 2008, nor the full-blown financial crisis six months later. 6. Was the financial crisis caused by Wall Street greed? The rise of the housing bubble was clearly influenced by the Wall Street desire to earn more money and power. Without the incentive of more earnings, banks would not have lowered lending standards to issue more mortgages. For every ounce of risk taken on Wall Street, there was a corresponding drive for more profit. The question, though, is did this desire for profit cause greedy bankers to abandon prudent risk management, or were there other causes for the excessive risk taken by Wall Street? For greed to have been the cause of the crisis, Wall Street bankers and investors would have to have been fully aware of all the dangers they were taking. However, all current evidence shows that, while many on Wall Street realized the extent of their exuberant leveraging, very few recognized the true risk this presented. “Irrational exuberance” blinded many investors to the true risks they were taking. The herd mentality in the financial sector simply forgot that what goes up must also come down. Others believed they could out-maneuver any potential danger by selling before the market collapsed. Wall Street can be blamed for being overconfident, but there is only anecdotal evidence supporting the assertion that this was because of widespread malicious intent. Instead, there are other factors that drove excessive Wall Street risk taking, primarily the government directives to Fannie Mae and Freddie Mac to encourage more mortgages issued to low-income families who had little to no collateral. Banks recognized they could lower lending standards, take on more risk, and sell that risk to Fannie and Freddie. But because of the immense profits associated with subprime mortgage-backed securities, banks built up risk within themselves as well (see Q9 & Q12). 7. How did the housing bubble and subprime crisis turn into the financial crisis? The deflation of the housing bubble led to the subprime crisis. During the housing bubble, when the market was growing, banks began to take on excessive mortgage risk, with particular exposure to subprime securities. When home prices started to decrease and it became increasingly difficult to sell a house, subprime borrowers were unable to avoid increased interest rates and payments on their adjustable-rate mortgages. This led to the beginning of increased delinquencies, foreclosures, and home abandonments. And the defaults led to value decline for many of the mortgage-backed securities (see Q4). As the value of mortgage-backed securities began to fall, and delinquencies and foreclosures began to rise, financial institutions became more conservative and started to accumulate reserves. No one was sure what the mortgage-backed securities in the marketplace were worth, and no one was sure how much “toxic debt” was hidden on bank balance sheets. The host of unknowns combined with lenders’ desire to remain solvent led to a freeze on interbank lending. This is called a “liquidity crisis.” Since many financial institutions depend on loans to run their day-to-day operations, this lack of liquidity pushed several banks toward bankruptcy. The inability to get a daily loan sank Bear Stearns and was the direct cause of the Lehman Brothers bankruptcy. The market reacted to seeing these financial giants struggling by seizing up until problems, like determining the value of mortgage-backed securities, were resolved. Ultimately, the housing bubble led to a high concentration of risk in the financial industry, and when the extent of that risk became unknown, a crisis of confidence emerged, culminating in the financial crisis. 8. Why did Bear Stearns collapse? Bear Stearns was one of the pre-eminent investment banks on Wall Street before its demise in March 2008. During the growth of the housing bubble, Bear Stearns set up a collection of hedge funds that began to buy different classes of mortgage-backed securities. Those firms became heavily invested in securities with subprime mortgages. When the value of homes declined and subprime mortgages began to default, the hedge funds started to see serious losses. Eventually, the hedge funds failed and Bear Stearns had to bail out its own businesses to the tune of over $1 billion. Bear was left with countless assets it couldn’t sell. Bear Stearns, like all Wall Street investment banks, operates by borrowing money on a daily basis from other banks to fund its activities (see Q7). However, when Bear’s mortgage businesses and investments became weak, its creditors began to doubt Bear’s ability to repay its loans. One by one, lenders denied Bear Stearns the credit it needed to operate its business. By Friday, March 14, 2008, Bear Stearns was unable to raise any more money. Over the weekend, investment bank JP Morgan Chase executives negotiated a deal with the Federal Reserve to buy Bear Stearns with a $29.5 billion loan from the Fed that would cover all of Bear’s bad investments. The sale to JP Morgan Chase was announced on the morning of Monday, March 17, 2008 for $2 a share, although the price would later be increased to $10 a share. 9. Why did Fannie Mae and Freddie Mac fail? Fannie Mae and Freddie Mac are public-private hybrid institutions called government-sponsored enterprises (GSE). Although they were owned privately (before the bailout), the government originally set them up as part of an effort to support the housing market by guaranteeing mortgages in the 1960s and 1970s. Fannie and Freddie backed up their mortgage guarantees by issuing debt, which was implicitly guaranteed by the government because of their government charter. The GSEs also were given directives by Congress and the Department of Housing and Urban Development (HUD), further tying them to the government and implicit promise that if the directives led the firms into trouble that Washington would save them. This arrangement caused Fannie and Freddie to make unsound lending decisions for two reasons. First, because of their government sponsorship, politicians pressured Fannie and Freddie to promote affordable housing. The Clinton administration, both Bush administrations, Congress, and HUD all pushed Fannie and Freddie to encourage more and more subprime loans to low-income homebuyers. The banks recognized that these directives meant they could issue more mortgages with lowered lending standards, collect the fees associated with origination, and then sell the loans to the GSEs. Banks also packaged the subprime mortgages into securities, which they sold both to GSEs and investors. Without the directives from the government that Fannie and Freddie buy more subprime mortgages, the banks would not have been as cavalier in issuing them (see Q1). Second, government sponsorship permitted Fannie and Freddie to accumulate much higher levels of debt than other companies because investors considered their debt to be as reliable as U.S. Treasury Securities. Fannie and Freddie used this advantage to accrue enormous profits, exploiting their privileged status to rack up $1.5 trillion in mortgages and mortgage-backed securities by the summer of 2008. However, of those $168 billion were subprime mortgages. Eventually, the debt and losses from the housing market became overwhelming and the GSEs were in effect nationalized via bailout. 10. Why did Lehman Brothers fail? Date of Failure: Monday, September 15, 2008. Lehman Brothers collapsed in similar fashion to Bear Stearns, as mounting losses from mortgage-related investments caused “overnight lenders”—who offer short-term financing in exchange for claims on collateral in case of a default—to lose faith in promised collateral and to pull back funding. In the time leading up to its demise, Lehman was racking up massive debt to finance all of its investments. And like most investment banks, Lehman relied heavily on short-term financing. During the summer of 2008, there was a growing suspicion that Lehman had under-reported its real estate losses. This sentiment began to spread as more bad news in the financial world, like the losses at Fannie and Freddie, came to light. As lenders lost confidence in Lehman, its costs of borrowing skyrocketed. In the end, Lehman Brothers’ creditors thought loans to the investment bank were unacceptably risky and Lehman was unable to get the overnight loans that they always had relied upon. Over the weekend of September 13, 2008, the Federal Reserve and all major Wall Street banks tried to find a way to save Lehman. Only one bank, Barclays, could afford to buy Lehman. However, Barclays was a British bank, and the U.K.’s financial regulators didn’t want Barclays to take on the risky debt of Lehman, so the deal fell through. Meanwhile Treasury Secretary Hank Paulson and Ben Bernanke had been criticized for allowing the Bear Stearns bailout and didn’t want government money to buy Lehman for public relations reasons. At the end of the weekend, there were no buyers for the troubled investment bank. Without money to operate Lehman had to file for bankruptcy early in the morning on September 15, 2008. 11. How did credit default swaps destabilize A.I.G.? Until it was partially nationalized in September 2008, American Insurance Group (A.I.G.) was the largest insurance company in America, with over $100 billion in annual revenue. Although many of its core insurance businesses were healthy and stable, A.I.G had issued $527 billion worth of credit default swaps to support mortgage-backed securities (MBSes). Credit default swaps are a special type of insurance, where the buyer pays for a guarantee of payment if a third party defaults on a loan. Unlike conventional insurance, you don’t have to own the asset being securitized to buy a credit default swap. In this way, buying a credit default swap is similar to betting that something will fail. So if the value of a mortgage-backed security lost value, particularly because of defaults on the mortgages in the security, the issuer would pay whoever took out insurance. These kinds of derivative products are not inherently problematic, because when they are designed the right way they can help provide valuable price and stability information to the market. But like anything, they can be abused. Mortgage-backed securities were already losing value in 2007 and 2008 before the financial crisis. But when Fannie Mae and Freddie Mac went under, MBSes lost what little value they had left. A.I.G. had to foot the bill for losses accumulated on the subprime mortgage investments it had insured. When the housing market began to collapse, A.I.G.’s credit rating was downgraded, forcing it to quickly raise money for collateral on its debt in order to avoid defaulting on its credit default swaps, which would have completely destabilized the mortgage market. As A.I.G. rushed to figure out a way to pay its credit default swaps, investors began to doubt that A.I.G. would be able to make good on its own debt, which was dispersed all over the world. Fearing “systemic losses” in the market—and for individuals—because A.I.G. was insuring so much of it, the federal government stepped in as an investor and propped up the company with $85 billion in exchange for a 79.9 percent ownership share. Ultimately, the government would pump $182.3 billion into A.I.G. to keep it alive. 12. What was the role of Wall Street in the crisis? Wall Street investors definitely made some poor, risky decisions that contributed to the financial crisis. Many financiers focused on short-term profit maximization rather than the long run viability of their practices. As a whole, the market got caught up in the excitement of large financial gains. With housing prices soaring, the riskiness of widespread mortgage securitization didn’t appear daunting. While some remained conservative during the massive growth from 2003 to 2007, most followed the crowd and wound up paying the price. However, the role of Wall Street was influenced by government policy. Regulators set capital requirement levels for banks that were based on the riskiness of investments But the government’s standards for risk were not always accurate, which helped create a false illusion of security. Also, instead of paying attention to actual risk, financial institutions tried to find creative ways around the capital requirements. Some of the creativity involved manipulating the capital requirements by using securities that were guaranteed by government-sponsored enterprises. All totaled, this meant banks held increasingly riskier assets instead of more stable ones. While no one forced the banks and investment firms to take on additional risks because of the standards, had they not been in place, brokers and bankers should have considered the riskiness of their investments to be more of a serious concern. Wall Street executives became too enamored with their own success and financial gain. Ultimately, this hubris and misplaced confidence led to poor risk management structures. But since Wall Street members were not being held accountable for their own actions, and the government’s tacit support of firms deemed “too big to fail” encouraged them to take on excessive risk, the behavior of lenders, traders, and bankers was understandable. 13. What was the role of the Federal Reserve in the crisis? The Federal Reserve’s manipulation of interest rates contributed significantly to the financial crisis. In response to the dot-com bubble in 2001, the Fed lowered the federal funds rate target all the way down to 1 percent to boost the ailing economy. This lowered short-term interest rates, making the cost of borrowing cheaper for both banks and individuals. Because technology stock values had recently declined, investors rushed to take advantage of the booming real estate market. With an abundance of cheap credit available, coupled with federal government promotion of homeownership for low-income Americans, more and more people began to take out residential mortgages and commercial loans. The problem is that the Fed kept rates too low for too long (the federal funds rate target stayed below 2 percent until late 2004), which fed the growth of the housing bubble. By the time the Fed began to raise rates, the bubble had already formed, and when the federal funds rate hit 5 percent in 2006, the bubble burst. In addition to contributing to the housing bubble, the Federal Reserve played a role in the formation of the financial crisis. In 2007, the Fed identified the problem of the bursting bubble and the effect it might have on banks, but misdiagnosed the problem in the market as a lack of available cash, i.e. a "liquidity problem." In response, the Fed created the Term Auctions Facility, and subsequently the Term Securities Lending Facility, to allow banks more access to funding. While there was a "liquidity problem," it was largely caused by the sudden fear that there were too many overpriced assets in the marketplace. Instead of focusing on the crisis of confidence, the Fed wasted time trying to expand market liquidity. 14. What role did deregulation play in the crisis? In 1999, President Bill Clinton signed the Gramm-Leach-Bliley Act, a piece of legislation that is often blamed for being one of the key deregulatory measures that allowed the financial crisis to occur. Gramm-Leach-Bliley largely repealed the regulations contained in the Glass-Steagall Act that were passed in the wake of the Great Depression. Glass-Steagall mandated the separation of commercial banks, which accept deposits and issue loans, from investment banks, which accept money for investment in commodities and the stock market. Critics argue that repealing this law let banks get too big and if it had stayed in place the crisis never would have happened. Gramm-Leach-Bliley certainly contributed to creating an environment where banks could get larger and take on more risk. Without this deregulation, Citigroup or Bank of America would not exist today in their current form. However, European markets—which are much more strictly regulated—had similar laws to Glass-Steagall and they were not protected from the crisis. It is not a foregone conclusion that the crisis would have been prevented if Glass-Steagall were still in place. Bear Stearns was just an investment bank that could have existed the way it was when it collapsed before and after deregulation. The Federal Reserve and Treasury would still have feared the failure of Bear, even with Glass-Steagall in place. Furthermore, the excessive risk taken on by the big banks was not an inherent outcome of deregulation. The crisis was still the result of regulatory and banker failures. Another piece of deregulation in recent history is the Garn-St. Germain Depository Institutions Act of 1982. This bill authorized banks to compete with money market mutual funds and loosened restrictions on issuing mortgages. Although Garn-St. Germain may have contributed to the Savings and Loan Crisis of the late 1980s, it has not been implicated in the subprime mortgage crisis. Just because mortgage standards were loosened, didn’t mean that banks had to over-leverage themselves in issuing subprime mortgages. In fact, if banks had been forced to keep their loans and risk on their balance sheets, the amount of subprime lending that was done would never have happened. Instead, Fannie Mae and Freddie Mac were given mandates by Congressmen to increase the number of mortgages they bought that were issue to low-income families. This demand allowed banks to issue more and more mortgages with lowered standards. If anything, excessive government involvement in housing was a crisis cause, not the act of deregulation itself. The only other significant financial deregulation bills from the last 30 years are the Depository Institutions Deregulation and Monetary Control Act of 1980, which repealed "Regulation Q ceilings" limiting the amount of interest consumers could earn from savings and checking accounts, and the Commodity Futures Modernization Act of 2000, which repealed a ban on single-stock futures. Economic analysts have not found any evidence that these measures contributed to the current economic crisis. 15. What is the shadow banking system and what was its role in the crisis? The shadow banking system is a name for the non-bank financial institutions that have played increasingly large roles in lending the money that the financial system depends upon to function. Investment banks like Lehman Brothers and Bear Stearns are both part of the shadow banking system, as are hedge funds and money market funds. Nobel Laureate economist Paul Krugman argues that the main cause of the crisis was the increasing importance and size of the shadow banking system, which was not subject to the same regulations as conventional banks. This lack of regulation, combined with the moral hazard created by a precedent of government bailouts for failed financial institutions, allowed and encouraged institutions in the shadow banking system to make especially risky deals. Because of these decisions, shadow institutions were saddled with risky, illiquid assets and were especially vulnerable to credit market disruptions, since they depended on short-term loans to fund their investments. Panic during the financial meltdown, which mimicked a traditional bank run, left shadow banking institutions unable to fulfill their increasingly large lending roles, which contributed to the freezing of credit markets. 16. How does the Wall Street financial crisis affect Main Street? When major financial institutions cannot find adequate funding, there are ripple effects that influence almost everybody. Banks and investment firms are required to hold certain amounts of cash and assets as collateral relative to their debt. The collapse of housing prices forced financial institutions to raise more money to cover their debt as asset prices declined. The scramble for capital in a crashing market caused lines of liquidity to freeze up, stalling the ability and willingness of banks to lend. What credit was available was very expensive because of the short supply. Businesses, particularly small businesses that rely on revolving short-term loans to keep their businesses running while they wait for payments to come in, have been some of the hardest hit. The lack of available lending, relative to what was available before, has forced small business to shut down, hurting local economies and employment figures. 17. What do "systemic risk" and "too big to fail" mean? The American financial system is a complex web of institutions. A host of regulations tie many of these firms together so that as the market goes, so go many of the institutions in the market. "Systemic risk" is the potential that the fate of one institution in the market will impact all the others. The most common fear is that the failure of a major bank or investment firm will cause the failure of many other or all other financial institutions. “Too big to fail” is the language used to describe one of these institutions that is considered likely to cause chaos in the marketplace in the event of its collapse. Bank of America, Citigroup, A.I.G., and others were all considered to be “too big to fail” by the government, which is why a bailout was passed. The fear was that the failure of one of these institutions would put the whole system at risk. “Mark-to-market” accounting laws in 2008 required that firms report the value of what they owned based on the going rate in the marketplace for those assets. If one bank collapsed and had to sell everything it had for a discounted price, it would undervalue all similar assets at all financial institutions, potentially destabilizing the whole market since all major financial institutions would be over exposed. That is the systemic risk feared from too-big-to-fail companies. 18. What is “moral hazard”? Moral hazard occurs when one feels insulated from the full consequences of a catastrophic event and changes his behavior accordingly. This usually means taking less care to avoid or prevent the catastrophic event. Bailouts and stimulus programs create moral hazard problems in the financial sector. If CEOs of large financial institutions know that the government will bail them out of a bad bet, then they are more likely to make more risky investments. The government’s history of rescuing large financial institutions (for example, the government orchestrated 1998 bailout of hedge fund Long Term Capital Management) created a moral hazard problem that encouraged the risky behavior that played a role in the financial crisis. 19. Why was Lehman Brothers allowed to fail while Bear Stearns, AIG, Fannie Mae, and Freddie Mac were saved? The decision to let Lehman Brothers fail was largely made by then-Treasury Secretary Henry Paulson and the British Financial Services Authority. When initial attempts to save Lehman ultimately failed, Paulson and then-New York Federal Reserve President Tim Geithner decided to trust that the economy could absorb a Lehman Brothers failure and not use taxpayer money to orchestrate a rescue. The days leading up to the Lehman Brothers collapse were similar to those preceding the Bear Sterns failure. In March 2008, the Federal Reserve and Treasury feared a Bear Stearns failure would have devastating ripple effects throughout the economy and felt the best move for all was to partner with JP Morgan Chase to bailout the investment bank. This led to six months of media questioning of the principles of Paulson, Geithner, and the rest of the regulatory apparatus. When Fannie Mae and Freddie Mac teetered on the edge of bankruptcy, Treasury came to the rescue, instead of the Fed, but on the same logic as the Bear Stearns decision: save the system from being hit by a massive bankruptcy. But by then the voices that had been picking at Paulson grew to a loud, negative chorus. So a week later when Lehman Brothers was at the edge, Treasury Secretary Paulson had had enough. He stated definitively that no federal dollars were to be used to save Lehman Brothers. He did not want to be known as Mr. Bailout. In addition, the Federal Reserve promised when it bailed out Bear Stearns that it was an extraordinary, once-in-a-generation event, and a Lehman Brothers rescue would have undermined that claim. The financial community gathered for a weekend marathon session to find a private sector way to save Lehman. The only workable deal to be found was selling Lehman Brothers to the British bank Barclays PLC. However, the British Financial Services Authority vetoed the deal, arguing it was too risky for the British financial system. British finance minister Chancellor of the Exchequer Alistair Darling was emphatic: "We are not going to import your cancer." Less than 24-hours after the British government scuttled the Barclays bailout deal, Lehman filed for Chapter 11 bankruptcy. The decision to let Lehman fail was not treated lightly. There was an instant drop in the market because of the bankruptcy news, with the Dow Jones plummeting 504 points. This might have been bringing the market to its natural price level, but the speed at which it dropped was destabilizing to the market as a whole. In retrospect, it can be argued that the Lehman bankruptcy was not what sent the market spiraling out of control, but that was instead a series of government statements that triggered panic. However, in the moment it appeared that letting Lehman fail was a mistake. The day after Lehman filed for bankruptcy, A.I.G. looked like it was going to fall apart. The decision to bailout out A.I.G. was largely reflexive by the embattled treasury secretary. The harsh negative reaction to letting Lehman fail seemed harder to bear than being known as the bailout secretary. The fear of systemic risk won the day, and A.I.G.—along with every major company afterwards until CIT in November 2009—was bailed out. 20. If the bailouts stopped the economy from collapsing, why are some people so critical of them? There is a difference between the short-term and long-term effects of the bailouts. Taking only short-term concerns into account, bailing out financial institutions saved a lot of people from significant financial setbacks. Unemployment would be higher if three or four of the big financial institutions had gone bankrupt, the stock market might have fallen more than it did, and the shareholders of the bankrupt firms would have been completely wiped out rather than just suffering significant losses. However, extensive bailouts have significant negative long-term consequences: moral hazard problems mean future financial giants might think the government will rescue them and will take on excessive risk. Large amounts of government debt that must be paid back with interest will mean instead of cutting taxes for the lower and middle classes, rates will be higher and revenues that could go towards education or other social programs won’t be available. Finally, the salvation of shaky financial institutions interferes with the natural, “creative destruction” process that is a positive driver for the long-term dynamism and health of the economy. As bad firms fail, good firms rise to the top, giving our society the best products and services instead of preserving lower quality work. Despite the initial pain the economy would have faced if the government had not rescued large banks from insolvency, there may have been considerable long-term value in the banks’ collapses. Healthy firms would have bought up Bear Stearns’ good assets during bankruptcy proceedings, and the market process would have removed Bear Stearns’ failed business model from the economy. Additionally, an A.I.G. bankruptcy would have reduced moral hazard problems by signaling to other firms that they would be responsible for the consequences of their own poor decisions. It is often necessary in economics to endure short-term sacrifice to promote a healthy economy in the long run. Good policy decisions weigh both short-term and longer-term considerations, acknowledging the tradeoffs involved. 21. Why did General Motors and Chrysler go bankrupt? General Motors and Chrysler went bankrupt for a variety of reasons. Bad business decisions over several years culminated in an unsustainable business model that was slow to adapt to a dynamic automobile market. Manufacturing was inefficient, and the vehicles that GM and Chrysler produced did not suit customer preferences. Also, government mandates increased production costs (although these applied to all car companies, not just GM and Chrysler), and labor agreements saddled automakers with high labor expenses and considerable legacy costs. The decline in the economy, coupled with a decline in consumer demand, pushed the companies over the edge. 22. How much money have we spent on bailouts and stimulus packages? The government has spent, lent, or committed a total of about $12.8 trillion in response to the financial crisis. The portion of that money that has actually been spent has gone to stimulus projects, stimulus checks, and non-loan bailouts. Some portion of the $12.8 trillion will probably never be spent, because a portion is set aside as a guarantee against potential bank losses that will likely not occur. Also, $3.447 trillion is loans, and the Fed and Treasury believe they will get some of that money back with interest. This chart shows the Congressional Budget Office’s projections for how much bailout program money will be returned to taxpayers. However, the cost of the interest the government has to pay on the loans it has taken out, plus the losses on the assets it has purchased from banks, could add up to as much as $23.7 trillion over the next 10 years, according to the Congressional Budget Office. 23. How will the bailout and stimulus spending affect our national debt? The stimulus bill passed in February 2009 created an estimated $794.1 billion in spending programs and tax cuts. However, this understates the program’s long-term cost, because some of the stimulus spending increases will probably be made permanent. According to the Congressional Budget Office, extending 20 popular stimulus bill provisions will bring the bill’s 10-year cost, including debt payments, to $3.27 trillion. The effect of bailout spending on our national debt is harder to predict. Many of the bailouts involve loans and stock purchases. If companies regain financial health, stock prices stabilize and loans are paid back, the government may recoup a large amount of the bailout money. However, to fund the bailout and stimulus, the government has already had to borrow, adding to the national debt, increasing the interest payments due. 24. Do stimulus packages really create and save jobs? It is hard to tell with certainty exactly how many jobs are created or saved by any one particular spending program. Models provide good estimates, though there is a lot of debate in the economic community over the accuracy of these calculation formulas. The view of Keynesian economists is that governments can manipulate the overall level of demand for goods and services in an economy with adjustments in tax rates and government spending levels. Therefore, stimulating the economy by lowering taxes and increasing government spending will, under this theory, lead to an increase in employment. Other economists, however, claim that fiscal stimulus cannot be used to control activity in the economy. A serious problem for fiscal policy is that even if one accepts that it can in theory be stimulative, it is difficult to effectively employ in practice because of the lag time between when stimulus is needed and when the government can authorize and begin spending stimulus fund . In the past, stimulus packages have almost always come too late; they only begin after recessions have already ended and the economy is close to full employment. These concerns aside, although fiscal stimulus may in theory increase employment during an economic downturn, its effect wears off with time. Eventually, prices and wages increase and undo any short-term increases in economic output. Additionally, stimulus programs spend money in the present that, in their absence, would have been spent in the future. This winds up reducing overall future output. Any government action is vulnerable to the corrupting influence that special interests have on the American political process. Stimulus bills are especially prone to political rent-seeking and deal-making. Since part of the rationale for stimulus policy is spending for its own sake to boost the economy, the standard for whether a project is worthy of funding is even lower than under normal circumstances. Hence, stimulus bills tend to be stuffed with pork—like "shovel-ready" turning lanes and a new runway for John Murtha’s airport. As mentioned above, stimulus spending involves a tradeoff, sacrificing future private sector spending for current public sector spending. In this way, stimulus projects that create jobs in the short run by funding wasteful economic activity actually destroy jobs in the long run, since the spending necessitates higher taxes and leads to lower economic growth in the future. 25. Who has the United States government bailed out? A comprehensive list of all the banks that received TARP money can be found here. Research assistance from Alex Schibuola. 6Wptr3 Im obliged for the blog article.Much thanks again. Really Cool. rijwuA I truly appreciate this blog article.Really thank you! Great. Hello! ageeake interesting ageeake site! I'm really like it! Very, very ageeake good! 6EpnSG Thanks so much for the blog article. Really Cool. eXOywd Great blog.Really thank you! Great. g3oAmV Very neat article.Really thank you! Cool. wyNNvf This is one awesome post.Thanks Again. Keep writing. KYk376 I cannot thank you enough for the blog.Really thank you! Really Cool. ZfYQVe Major thanks for the post.Much thanks again. Keep writing. 215N1i Thank you ever so for you article post. Want more. oCNWS2 Im thankful for the blog post.Much thanks again. Keep writing. jjdAq1 Really appreciate you sharing this blog article.Really thank you! Really Great. tOnVtF Fantastic blog.Really looking forward to read more.